To state the obvious: Your writing will get done in less time. You will find yourself more productive because your ideas can flow onto the page without the distraction of typos. You will not only be more productive, but more efficient. Writing means multi-tasking—typing and generating ideas and forming sentences. You are more efficient when you can focus on just one task. Are You An Average Typist? Time when you have above average speed. Since you’re a freelance writer, we’ll say that you are a little bit more advanced and type 50 words per minute. Therefore, if you were to write a 1,000 word article at 50 WPM without stopping, you would finish your article in about 20 minutes. Now let’s say you get paid 10 cents per word. This means that you will be making $300/hour. Time when you focus on improving your speed to the speed of many professionals. Now what if you were to make an effort to improve your typing? Typing 80 WPM is considered very fast, yet this is somewhat common amongst those who make typing their profession. Many writers actually record typing over 120 WPM on sites such as 10fastfingers.com. However, let’s just say you improved your typing skills to 80 WPM. You could take that same 1,000 word article and, once again, type continuously without a break. In this case, you would be finished in 12.5 minutes. If you were getting paid 10 cents per word for this same 1,000 word piece, but you had a faster typing time, you will be making approximately $480/hour. What about Errors and Research Time? Now I don’t claim to be a math genius. You have probably noticed that there are a few factors not discussed in the above example. First, what if you type lots of WPM, but make a bunch of mistakes. Well, any WPM average number was derived by accounting for these mistakes. According to Data Entry Home Business, WPM researchers go through and count the number of mistakes made and subtract that from the total number of words typed. For example, if someone typed 45 WPM and made three mistakes, their total WPM average would be 43 WPM. It might sound harsh, but if you really think about it, typing quickly without accuracy is somewhat pointless! These numbers also do not account for the time it takes someone to craft an article. After all, creativity and research takes time. Therefore, finishing a 1,000 word article in 20 min and making $300/hour simply won’t happen. However, the numbers do give you a feel for the difference in time and money that occur. The numbers are mere representations. If you find that increasing your typing speed would help improve your work, there are several different things you can do including take typing classes, practicing on your own by copying paragraphs of novels, or buying typing software. You can visit Top Ten Reviews to help you decide which software is the best fit for your needs. 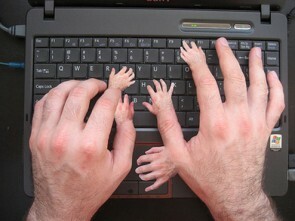 If you have no idea how many WPM you type and are wondering if you even need the help, visit CalculatorCat.com. I got 83 WPM, and according to the Guinness Book of World Records 2011, the fastest typist ever recorded was Michael Shestov who recorded over 200 WPM. What’s your time? Amanda DiSilvestro is a writer on topics ranging from freelance writing tips to starting a business. She writes for an online resource that gives advice on topics including phone systems to small businesses and entrepreneurs for the leading business directory, Business.com. I think writers only need to be average typists. I can type about 60 wpm but in the average day I only put about 2,000 words on paper. Typing and writing are two completely different things! I see your reasoning in the “Are You an Average Typist?” section, but in my experience things just don’t work that way. If you typed 80 wpm you could technically do more than 38,000 in an eight-hour day! I do agree that being a fast typist isn’t a necessity because you’re right–no one writes for 8 hours per day. If you’re just doing a little bit of writing, an average pace is probably fine. In fact I bet many people don’t even know whether they’re average or above average (I know I didn’t). 38,000 words in an 8 hour day would be insane! I just think it’s fun to play around with the idea. Just one extra way to improve your craft. Thanks so much for reading! Totally. Those one-finger typists would never make it. I think as long as you at least have the home-row keys typing down you’re doing pretty well.